Data & Analytics solutions can help you transform the way you explore data, find answers, and take action. It can also help reveal new opportunities, quickly adapt to market changes and make faster and more accurate decisions. Powerful data visualizations in PowerBI and Tableau. We add value by providing our clients with comprehensive business intelligence solutions – from data silos to data discovery – that create a full picture of corporate initiatives and improve decision making. Whether you’re driving decisions across your organization or embedding insights into your software, app, or website – choose the analytics software that works the way people think. With one click, users can explore the data behind their dashboard using intuitive tools that make finding answers easy. 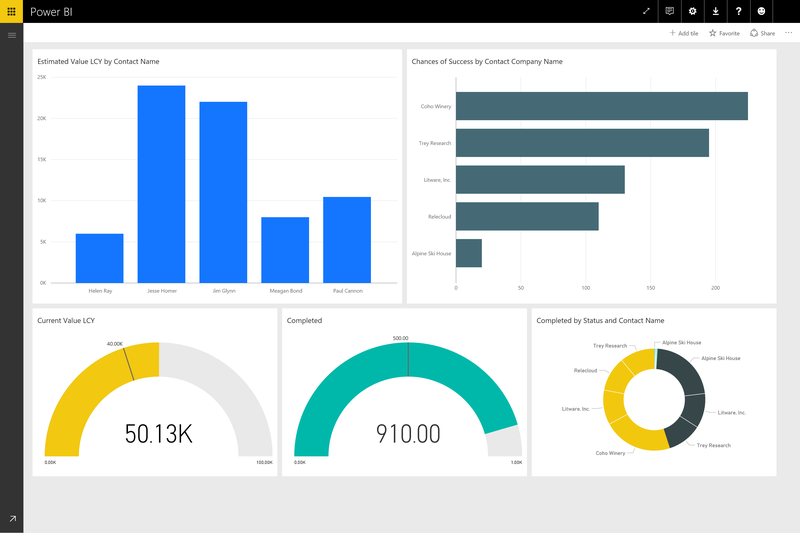 Creating a dashboard is simple thanks to over 50 connections to popular business applications, complete with pre-built dashboards crafted by experts that help you get up and running quickly. And you can access your data and reports from anywhere with the Power BI Mobile apps, which update automatically with any changes to your data. Learn more on Microsoft website. Tableau is another platform for live visual analytics and unlimited data exploration. Interactive dashboards help you uncover hidden insights on the fly. Tableau harnesses people’s natural ability to spot visual patterns quickly, revealing everyday opportunities and eureka moments alike. Read more at Tableau website.